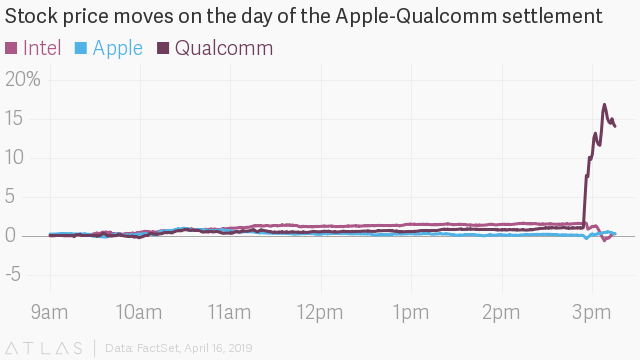 Before the first day in court for the lawsuit between Apple and Qualcomm could wrap up, the two companies jointly announced they are dropping all litigation against one another. The companies had been locked in a bitter dispute over royalties and the licensing fees that Apple was required to pay Qualcomm to use its chips in its devices. As CNBC cites, Apple argued that Qualcomm, one of a select few companies that made the radio and processor chips smartphone makers could use, was abusing its position in how it set its fees. The news sent Qualcomm’s stock soaring more than 20% over yesterday’s closing price, to around $70. Apple’s stock price was up around one-tenth of a percent, sitting just below $200. The news was less welcome for Intel. Partially because of its lawsuit with Qualcomm, Apple used Intel as its sole provider of modem chips for the iPhone XS line released in late 2018. Users reported that they struggled to reconnect to wireless networks after leaving or entering buildings, among other issues. Now Apple will likely return to using Qualcomm modems in its new phones. Given the issues some Intel modems presented on last year’s phones, and Intel’s reported problems hitting deadlines on delivering 5G modems, the company may well lose out on some lucrative Apple contracts in the future. Intel’s stock price initially dropped about 2% around the time of the news of the deal, to $56, but rebounded slightly as the market closed. Soon after Apple and Qualcomm announced their agreement, Intel announced that it was exiting the 5G smartphone modem space entirely. There’s no guarantee that Apple would automatically look to Qualcomm for 5G modems when it’s ready to launch a 5G phone—it’s reportedly been researching the technology itself and has spoken with Samsung and MediaTek about its modems. Today’s announcements would suggest, however, that Apple would look to Qualcomm first—or presumably that’s how Intel sees it.